Fuoco Di Napoli is Atlanta’s newest pizzeria obsession. Open less than 168 hours, pizza fans from all parts of Atlanta have made it over to Buckhead’s newest pizza joint to test the skills of Fuoco’s pizzaioli, one Enrico Liberato. Now, much like Chang, Liberato has resurfaced at a restaurant that he has a stake in assuring Atlanta’s food crazed minions that he’s here to stay (or so people hope). While we wait and see if that holds to be true, I … like several others … have already stopped in to see if Fuoco Di Napoli is worth a fuss. Though it’s located in the heart of Buckhead, Fuoco Di Napoli quietly slipped into existence by opening in the oft forgotten section of Pharr Road that heads west off Peachtree. The building at 30 Pharr Rd has laid dormant since McTighe’s Irish Pub went the way of the dearly departed. I was a frequenter of McTighe’s during my more youthful years, but I’m pretty sure I never showed up there any early than midnight. By that time, it was always dimly lit and packed out with beer drinking youths; so, I can’t say I have a good feel for what the place really looked like back then. But fighting through some of my most beer goggled memories, I’d say that Fuoco Di Napoli’s owners just touched the place up a bit. There’s a new paint job in place, pizza equipment has been installed, and a number of large tables, most of which offer a direct view of Liberato and his pizza fortress, now occupy the partitioned room. 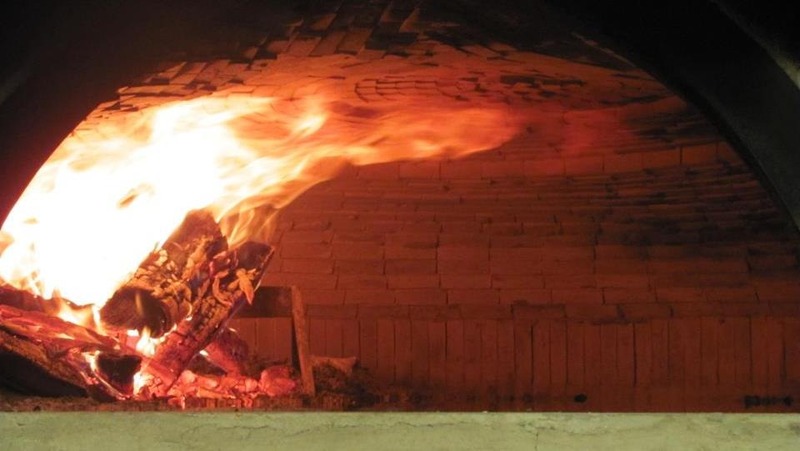 Speaking about the pizza equipment … the beautiful brick pizza oven was assembled via hand by the gang at FdN. Oh, and given that these somewhat oversized tables are accompanied by wood benches, I’d venture a guess that Fuoco will encourage various parties to join up for a communal experience should the crowds intensify. Aside from a single small television and a picture touting Boss Hog as the first “patron” saint of Fuoco, di Napoli’s walls are decorated exclusively with a slew of pizza certifications and awards. Truth be told, pizza certifications have gone the way of online college degrees: you can print them up ad nauseum so their presence on the walls offers little comfort. Like many things in this world, I don’t care what it says on the degree … I only care what it does in my mouth. Fuoco di Napoli (aka Fire of Napoli) doesn’t need to justify themselves with such trivial advertisements. The menu at Fuoco is refreshingly restricted. It’s comprised of seven pizzas, a calzone ($15), and a simple side salad ($7) for variety’s sake. The pizzas are available at every price point between $13 and $17 and come in at around 10” in girth. San Marzano tomatoes and bufala mozzarella dominate the menu though you can find a few other cheeses in the calzone and a sans tomato option that’s happily inundated with vegetables. Ordering isn’t hard to figure out – you step up to the register near the door, figure out your thang, take your number, and take a seat. It’s of course ridiculous that you have to buy bottled water (cutely labeled with custom FdN logos) as there’s no tap option. So make sure to factor in a few extra-bucks should you decide to have anything to drink. I’ve now made several stops into Fuoco including (but not limited to) a visit on the very first day and a chance encounter with an off the property consumption. I’ve had several of their pies and here’s the dealio: this is pizza geared towards the pizza snob in all of us; however, it’s wildly inconsistent. But perhaps the best explanation for what it’s like to eat at Fuoco right now is to juxtapose my experiences against those of Antico’s earliest days. The parallels between Fuoco di Napoli’s beginnings and the rise of Antico Pizza Napoletana are striking, but so too are the differences. Both exist in small buildings just off some highly trafficked roads. Both opened with no word from traditional press outlets only to explode thanks to the blogosphere. Both rely on food runners and queue lines as opposed to tableside service. Perhaps most importantly, both attempt to invoke images of halcyon days through the use of wood burning ovens, ingredient lists that focus on traditional options, and through pizzas styled after those made across Italy. While Liberato serves as a thread common to Antico and Fuoco, Fuoco is Liberato’s first opportunity to call all the shots, so you won’t get a carbon copy experience. Still, my opinion of Fuoco in its earliest days is strikingly similar to my thoughts on Antico’s arrival. The pies at Fuoco are noticeably smaller than Antico’s. The crust isn’t nearly as thick as AP’s but still drifts towards chewier than crispier. Whether that’s intentional remains to be seen. Every example of pizza beyond the simply dressed marinara or margherita has come absolutely stacked with toppings; but, there are some serious chinks in that armor. The sausage was unpleasant to say the least as it took on an almost sour taste. Housemade or not, I suspect that recipe needs some serious attention. But even beyond the toppings, and far more crucial to this pizza’s success, the foundation needs consistency. At it’s best, a margherita from Fuoco arrived with an even application of sauce and cheese. Other examples did not fare so well. It’s apparent that Fuoco wants to deliver pizzas with less sauce than one might find at a place like Antico. This is a smart move. It allows for the crust to hold up better and remain firmer for a longer period of time. It also allows for a person to enjoy every aspect of a bite instead of trying to find hints of flavors through careful examination of a single taste. I’ve seen pizzas absolutely devoid of sauce as well as examples where the cheese and sauce were applied so unevenly that at times you forgot both components were elsewhere on your tray. Then I’ve had examples where you’d think we had ordered cheese toast. Meanwhile, the oven and dough methodology are clearly in their gestation periods. I have yet to establish exactly what type of char Liberato is going for. Some of Fuoco’s pies are seared off quite dramatically, others merely bubble ever so slightly. Neither is distinctly better, but a single vision needs to come through. Meanwhile, the dough is made in small batches but there appears to be an inconsistency in quality control. If, as I am assuming, the dough isn’t consistently stored in the same conditions, then that further explains the divergence in taste and texture between pies. Given that no pizza crust could withstand the weight of toppings as seen in Fuoco’s earliest examples, it’s still a safe bet that the crust does a better job of holding itself together than many examples seen elsewhere in the 404 (and 770 and 678). There are also too many slipups in what we might call “the little things” for this place to be immediately deemed a godsend. I have seen some god awful cuts to my pizzas whereby we have one tiny slice on one side and another huge slice at its opposite. This carelessness seems to extend to the price point. Restaurants without table service should be able to cut down on their prices. Still, it’s Buckhead and this is “gourmet pizza,” so whatevs. Many a folk have lauded Fuoco Di Napoli out of the gate and except for this little journal entry, I have yet to see anyone say anything less than wonderful about it. When people declared Antico the best thing ever just after it arrived, it was understandable if not forgivable. Back in 2009, Atlanta’s pizza scene was relatively dormant. But now, with over ten establishments playing around in the “pizza snob” category – it’s ludicrous to declare Fuoco Di Napoli the most amazing thing ever. Excellent pizza is about balance and attention to detail. That attention to detail leads to a carefully constructed disc that will consistently impress over time. Fuoco di Napoli still has a long way to go in both of those departments. If you fancy yourself the adventurous food explorer, then you absolutely should swing by in these early days. There’s a good chance you might just get blown away. But if you’re more prone to make sure your dollars are wisely spent … take a deep breath and give this pizza a little more time to cook because it’s just not there yet.